June 18, 2008 -- On the heels of his U.S. Open victory, Tiger Woods today bowed out of the rest of the PGA tour season to get ACL reconstruction surgery on his left knee. That's the same knee that had arthroscopic surgery in April, as well as other operations in 1994 and 2002. Woods also has a double stress fracture of his left tibia (shin bone) due to intense rehabilitation and training before the U.S. Open, states Woods' official web site. As Woods battled his way to victory in a sudden-death playoff, he could be seen wincing in pain. But his ACL injury dates back to last year, when he tore his ACL while running at his Florida home. Woods decided not to get ACL reconstruction at the time and to play through the pain. He won five of his next six tournaments, then had arthroscopic surgery on his left knee in April. Did Woods push too hard in the U.S. Open? And what does his latest surgery mean for his career? WebMD spoke with Allan Mishra, MD, and Patrick McCulloch, MD, about that. Mishra is a clinical assistant professor of orthopaedic surgery at Stanford University Medical Center. McCulloch is an assistant professor of orthopaedic surgery and sports medicine at the Baylor College of Medicine in Houston. Mishra and McCulloch aren't treating Woods. Do you think the sudden-death playoff may have pushed his knee over its limits, or do you think that wasn't the deciding factor? McCulloch: If a knee is painful and swollen, we generally recommend cutting back on the activities. In his case, he didn't have the opportunity to do that and in fact had to play more than expected. I think that when you continue to play with a painful knee or a swollen knee, it tends to do you a disservice. Mishra: I'm sure he wasn't happy about playing an extra 18 holes on Monday and then having to go to the sudden-death playoffs; he certainly wasn't counting on that. I don't know if it pushed him over the edge because he already knew he had a torn ACL. Do you think he tried to come back too fast after that arthroscopic surgery in April? Mishra: No, I don't know for sure, but he knew what he had -- it sounds like he knew he had an ACL tear and made a conscious decision not to get it done and now he's going to have to do the bigger procedure, which actually in the long run may be better for him. McCulloch: It's hard to know what he had done [in April]. If he had a meniscus tear and the torn part was removed, then typically we let patients walk on it right away. They're off crutches in a few days, and they can usually return to sports around the six-week mark. So his timing would have been appropriate for that. In his case, it's different because he's had a torn ligament as well, so he may have developed new problems or new injuries in the knee related to that. Is this an injury that an elite athlete could come all the way back from? McCulloch: Yes. This is a very common injury in general and in professional sports. There are over 100,000 ACL reconstructions performed per year. The general success rates of patients rating their knee as good to excellent are in the 90th percentile. There are several instances of other professional athletes who have returned to the highest level of competition after this, and given Tiger's demonstrated resolve and focus, I have no doubt that he will return fully. Mishra: I think, as a fan, that he can come back and that he didn't do anything permanent to make him less stable to have a long career. That will only be known by Tiger and his doctor. People can come back from an ACL reconstruction and have done that in many, many other sports at elite levels. So I have no doubt that he'll be back at the same level -- which is to win the U.S. Open -- or better. McCulloch: The ACL is the anterior cruciate ligament. It's a ligament that goes between the thigh bone and leg bone in the knee. The role of the ACL is to help to control abnormal motion at the knee. When the ACL is torn, the leg has a tendency to slip forward and to rotate in an abnormal fashion, which can give people a sense of instability, as if their knee will buckle on them. At the time of an ACL injury, the leg slips forward and because of that, you can sustain a tear of the meniscus, which is a protective cartilage that sits between bones. 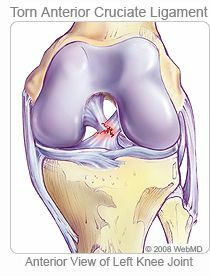 Approximately 40% to 50% of patients will sustain a meniscus tear at the time of the ACL injury. McCulloch: The surgery itself is done on an outpatient basis. We can't repair that ACL so we just make a new one. ... We'll take a tendon -- either from somewhere else on the patient's knee or from a donor ... it's fixed to the femur and fixed to the tibia. Mishra: It typically is a much bigger deal than just a knee arthroscopy [the type of surgery Woods had in April]. You've got to reconstruct the ligament, which is a bigger challenge than doing just a meniscus surgery. It takes an hour and a half or two hours of time, depending on how they do it. When is ACL reconstruction surgery needed? McCulloch: The decision whether or not to reconstruct the ACL ligament is based on several factors, the most important of which is the patient's desired activity level and type of activities they engage in. If someone has a low demand on their knee and they tend to participate in linear sports such as jogging or running or swimming, they may do fine without having the ACL reconstructed. And in fact, Tiger went on to win five of his next six or seven tournaments after he had rehabilitated from the torn ACL itself. However, one concern is that when the knee has an abnormal motion to it, if you do engage in cutting-and-pivoting sports, the knee can continue to give way, and this can cause further damage in the knee. There's a high rotational torque to the knee in the forward leg during a golf swing, and this is Tiger's left knee, which is his forward leg. With an ACL-deficient knee, you do run the risk of developing further tears in the meniscus over time. Mishra: It's amazing he won the U.S. Open, given the fact he didn't have an ACL reconstruction [earlier]. To be able to compete at that level with that sort of disability is flat-out astounding. What is the rehabilitation process like? Mishra: The rehab process is range of motion first, followed by strengthening, and then coordination and endurance. ... What he's facing is six to 12 months of time to get back into superior condition, but what does that mean for Tiger Woods? Hard to tell. I mean, he beat everybody else and he didn't have an ACL. McCulloch: The patient is usually off crutches within a few weeks. They then need to continue work on regaining their range of motion and their strength in the knee while we wait for the new ligament to heal into place. What about the stress fractures? McCulloch: I find that kind of curious. Stress fractures are often microscopic fractures that occur in the bone. They often won't show up on an X-ray, but they show up, because of swelling, on an MRI. In general, stress fractures tend to heal when you limit the amount of activity on them. So in a runner who develops a stress fracture, if we take them out of, say, marathon training, the stress fracture will often get better on its own. There are some stress fractures where we recommend that you be on crutches for a period of several weeks or months to allow it to continue to heal. In [Woods'] case, it's not clear to me whether he had true stress fractures or these bone contusions or a stress response that we often see in relation to ACL instability. If we find out later that rather than being on crutches for just a week or two that he's on them for several weeks, that may be an indication that they're hoping to take stress off that injured bone. WebMD Medical News: " Tiger Woods' Knee Surgery: FAQ." Allan Mishra, MD, clinical assistant professor of orthopaedic surgery, Stanford University Medical Center. Patrick McCulloch, MD, assistant professor of orthopaedic surgery and sports medicine, Baylor College of Medicine, Houston.